Chief Complaint: Worsening vision and progressive corneal ectasia in a patient with keratoconus. History of Present Illness: A 22-year-old male with keratoconus was referred for progressive corneal ectasia and worsening visual acuity. Initial management included spectacle correction, but progression of his disease required correction with rigid gas permeable contact lenses. Best corrected visual acuity was 20/100 OD, 20/50 OS and 20/50 OU. The patient was unable to work because of poor vision. Glasses did not provide adequate correction and he was intolerant of contact lenses, particularly in the right eye in which the lens continued to pop out despite the best possible fit. The patient was referred to the University of Iowa Cornea Service for consideration of surgical intervention. 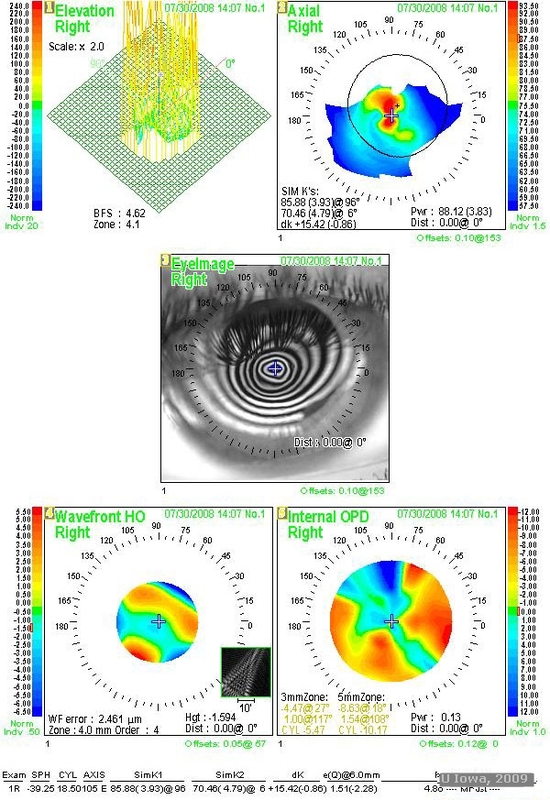 Past Ocular History: Progressive keratoconus OD > OS as described above. Family History: Father with keratoconus. OD—clear cornea with central thinning (central corneal thickness 419 microns, thinnest 360), Fleischer ring, Vogt’s striae, Munson’s sign. OS—clear cornea with central thinning (central corneal thickness 467 microns, thinnest 396). Figure 1: Slit lamp photo OD showing iron deposition in the corneal basal epithelial cells (Fleischer ring). 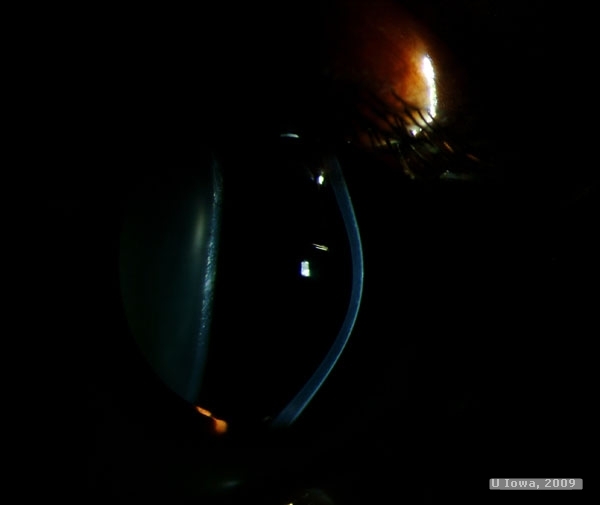 Figure 2: Slit lamp photo demonstrating ectasia and protrusion of the cornea. 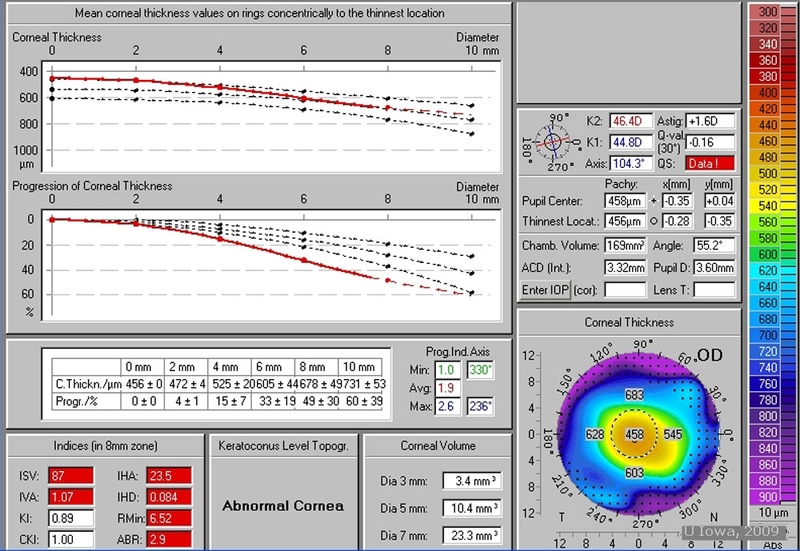 Central corneal thickness for our patient was 419 microns. Penetrating keratoplasty is a well-studied and long established surgery for the treatment of corneal disease such as keratoconus. However, replacement of donor endothelium makes host rejection of the graft more likely. A 15-year study of the outcomes of PK demonstrated graft failure in 76 out of 500 eyes, with rejection accounting for 25% of those failures. The overall probability of developing graft rejection was 23%. Late endothelial failure caused 29% of graft failure, (4) suggesting that DALK, which retains native endothelium, may increase long term graft survival. Deep anterior lamellar keratoplasty has been proposed as an excellent alternative to penetrating keratoplasty for corneal diseases that do not affect the endothelium. DALK preserves native endothelium and reduces host immune system reaction and graft rejection. In a recent study of outcomes using the "big bubble" technique, only 2 of 78 patients developed stromal rejection. (1) This fits well with other studies reporting rejection in 3-8% of cases (2). 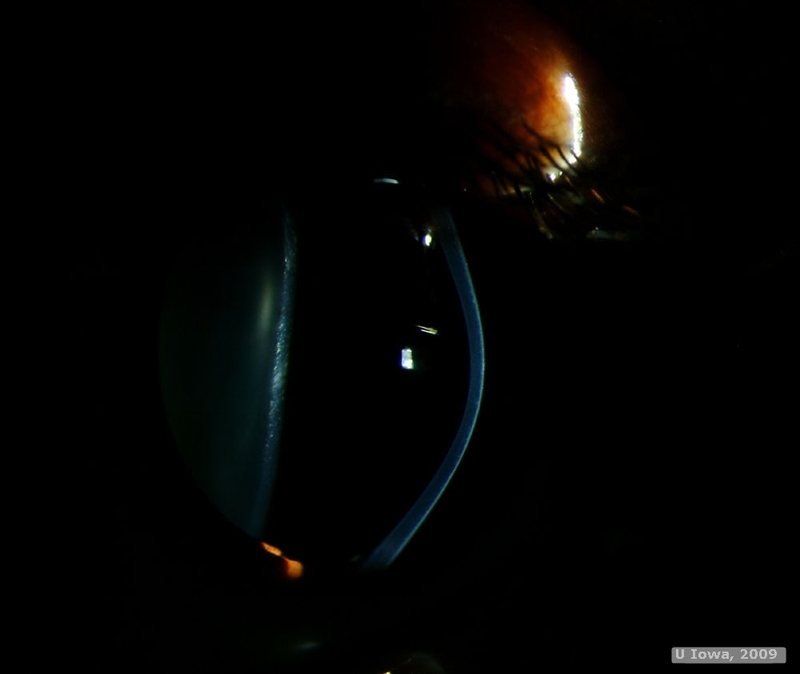 DALK using the "Big Bubble" technique as described by Anwar was recommended and successfully performed on our patient’s right eye. Two months post surgery, uncorrected acuity was 20/250. At 4 months post surgery, uncorrected visual acuity improved to 20/100, with best corrected vision of 20/60. At 6 months post surgery, the patient was fitted for contact lenses and ultimately achieved visual acuity of 20/50. Of note, OS vision has progressively declined, ultimately to a best corrected acuity of 20/80. Consequently, DALK has been scheduled for the left eye. Figure 3. Preoperative endothelial cell count of 2841 cells/mm2 demonstrates a healthy corneal endothelium, an important criterion when considering an anterior lamellar keratoplasty procedure. Figure 5: Pre- and post-operative Oculus Pentacam. Left: Pre-operative. Note severe central thinning. The graphs demonstrate that our patient’s cornea is much thinner than the average cornea. Right: Post-operative. Central corneal thickness is increased from 416 microns preoperatively to 458 microns. 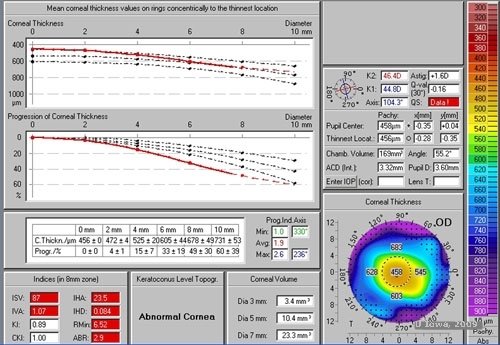 Our patient’s corneal thickness demonstrated graphically now falls much closer to normal ranges. Figure 6: Pre- and post-operative Nidek topography. Left: Pre-operative. Note the steep K values of 85.88 /70.46. Refraction estimated to be sphere -39.25+18.50x105. Right: Post-operative. K values are much improved, to 46.75 /44.94. Refraction has improved to sphere -1.75+ 2.25x 152. Keratoconus (KCN) is a progressive, non-inflammatory ectatic corneal disorder. It is commonly bilateral. The disease progresses throughout the second and third decades of life. Its etiology is unknown. Discordance between dizygotic and monozygotic twin studies suggest a genetic role in the development of KCN. A family history of KCN is common, as was the case with our patient and his affected father. The disease is multifactorial in origin. Many gene loci have been implicated in the development of KCN. These include loci in the chromosomal regions 2p24, (6) 3p14-q13, (7) 5q14.3-q21.1 (8), and 16q22.3-23.1 (9), identified in large single or multiple pedigrees by genome wide-mapping and suggesting an autosomal dominant model of transmission. Also identified by affected-only linkage analysis, indicating multifactorial transmission, are the chromosome regions 4q31, 5q31, 9q34, 12p12, 14p11, 17q24 and 20q12. (10,11) The visual system homeobox gene VSX1 on chromosome 20 has also been indicated in studies. (12, 13) Despite its higher incidence in patients with Trisomy 21, no loci on this chromosome have been identified. Protrusion of lower lid on down gaze (Munson’s sign). 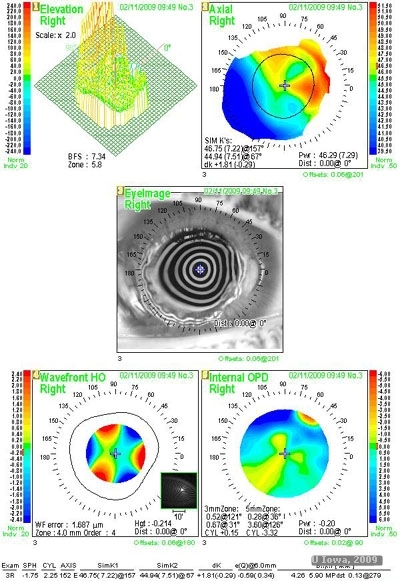 Fontana L, Parente G, Tassinari G. Clinical Outcomes After Deep Anterior Lamellar Keratoplasty Using the Big-bubble Technique in Patients With Keratoconus. American Journal of Ophthalmology 2007;143:117-124. 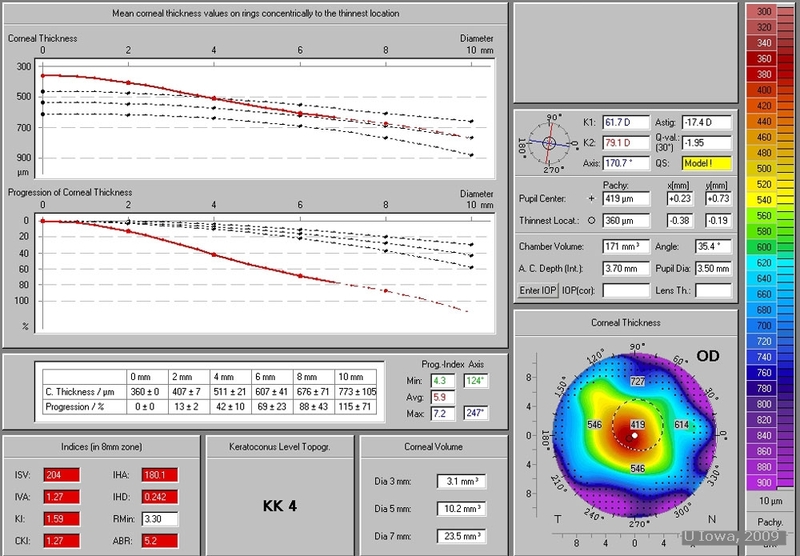 Watson SL, Ramsay A, Dart JK, Bunce C, Craig E. Comparison of deep lamellar keratoplasty and penetrating keratoplasty in patients with keratoconus, Ophthalmology 2004;111:1676–1682. Rice A, CL Funnell CL, Pesudovs K, Noble BA, Ball JL. 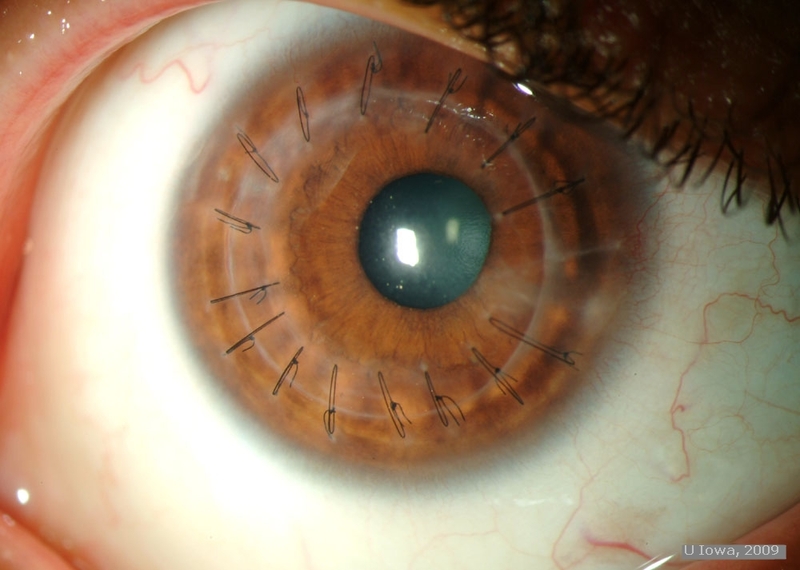 Mid-term outcomes of penetrating keratoplasty (PK) and deep anterior lamellar keratoplasty (DALK). Eye, 2009, advance online publication (PMID: 19197317). Patel SV, Hodge DO, Bourne WM. Corneal endothelium and postoperative outcomes 15 years after penetrating keratoplasty. American Journal of Ophthalmology 2005;139:311-319. Feder RS, Kshettry P. Chapter 78. "Noninflammatory Ectatic Disorders." IN Krachmer JH, Mannis MJ, Holland EJ. Cornea, Volume I. Fundamentals, Diagnosis and Management. St Louis: Elsevier Mosby, 2005. pp. 955-974. Hutchings H, Ginisty H, Le Gallo M, et al. Identification of a new locus for isolated familial keratoconus at 2p24. J Med Genet. 2005;42:88–94. Brancati F, Valente EM, Sarkozy A, et al. A locus for autosomal dominant keratoconus maps to human chromosome 3p14–q13. J Med Genet. 2004;41:188–192. Tang YG, Rabinowitz YS, Taylor KD, et al. Genomewide linkage scan in a multigeneration Caucasian pedigree identifies a novel locus for keratoconus on chromosome 5q14.3-q21.1. Genet Med. 2005;7:397–405. Tyynismaa H, Sistonen P, Tuupanen S, et al. A locus for autosomal dominant keratoconus: linkage to 16q22.3-q23.1 in Finnish families. Invest Ophthalmol Vis Sci. 2002;43:3160–3164. Li X, Rabinowitz YS, Tang YG, et al. Two-stage genome-wide linkage scan in keratoconus sib pair families. Invest Ophthalmol Vis Sci. 2006;47:3791–3795. Fullerton J, Paprocki P, Foote S, Mackey DA, Williamson R, Forrest S. Identity-by-descent approach to gene localisation in eight individuals affected by keratoconus from north-west Tasmania, Australia. Hum Genet. 2002;110:462–470. Heon, E; Greenberg, A; Kopp, K. K; Rootman, D; Vincent, A. L; Billingsley, G; Priston, M; Dorval, K. M; Chow, R. L; McInnes, R. R; Heathcote, G; Westall, C; Sutphin, J. E; Semina, E; Bremner, R; Stone, E. M. : VSX1: A gene for posterior polymorphous dystrophy and keratoconus. Hum. Molec. Genet. 11: 1029-1036, 2002. Bisceglia, L; Ciaschetti, M; De Bonis, P; Perafan Campo, P. A; Pizzicoli, C; Scala, C; Grifa, M; Ciavarella, P; Delle Noci, N; Vaira, F; Macaluso, C; Zelante, L. VSX1 mutational analysis in a series of Italian patients affected by keratoconus: detection of a novel mutation. Invest. Ophthal. Vis. Sci. 46: 39-45, 2005. Kennedy RH, Bourne WM, Dyer JA. A 48-year clinical and epidemiologic study of keratoconus. Am J Ophthalmol. 1986;101:267–273. Pearson A, Soneji B, Sarvananthan N, Sandford-Smith JH. Does ethnic origin influence the incidence or severity of keratoconus? Eye. 2000;14:625–628. 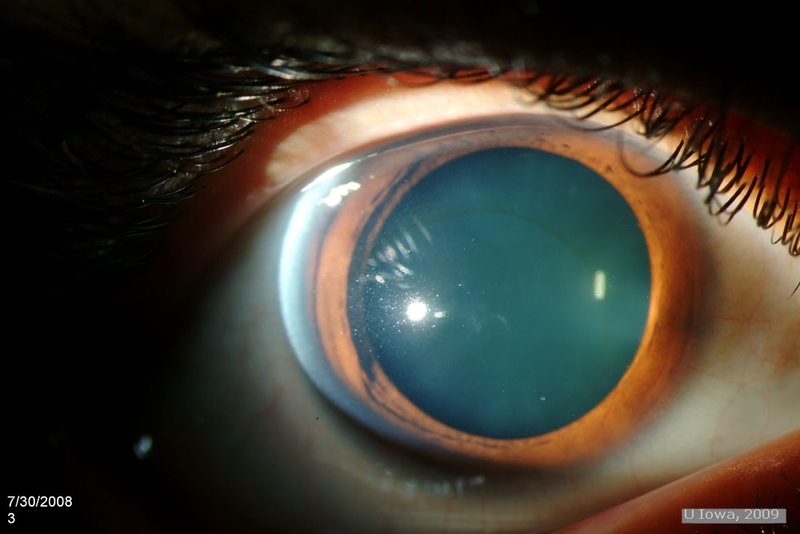 Suggested citation format: Raecker M, Goins K: Verticillata: Surgical Management of Keratoconus: A 22-year-old male with a history of progressive keratoconus. EyeRounds.org. October 5, 2009; Available from: http://www.EyeRounds.org/cases/98-Keratoconus-Surgical-Options.htm.